This is a Prius; in the parking lot of a Starbucks; in Beverly Hills; with an Apple sticker; and a couple public employee union stickers. (Sheriffs, but still). 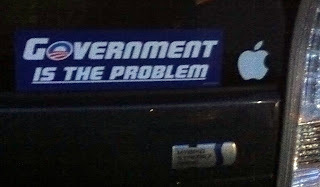 Yet also, this intriguing anti-Obama bumper sticker. People are complicated that way. I find it encouraging. Even some of the most liberal people seem to get the real problem. I see these on occasion in the Milwaukee area. Generally, some peace-loving East-side liberal has either "keyed" the door or torn off a mirror for the owner. I wonder if this is a couple who disagree on a few points? And an Apple sticker doesn't mean much. I've been using them since '86, and they've only been identified as trendy (and thus lefty) since the very fashion conscious iMac came out in '98. Like Ben, I'm a long time Apple user -- since 1986. And, if I'm not mistaken, I saw a photo of Dubya using one of those igloo iMacs. A lefty retired public employee friend was over for bridge the other night and asked, "How many front doors do you think there are that have Apple and NRA stickers on them?" Then again, I drive a Yukon. I think SEIU brass will become suicidal after the 2012 results come out. Who ever dreamed public employees forced to contribute to union coffers would be smart enough to vote Dhimocrats out? 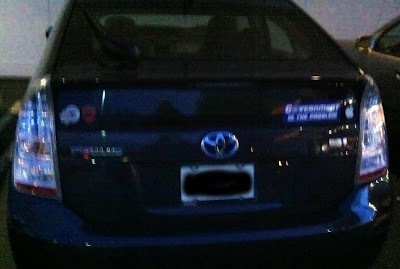 I drive a Prius (50 mpg), been using Macs since 1986, and am even a college teacher. 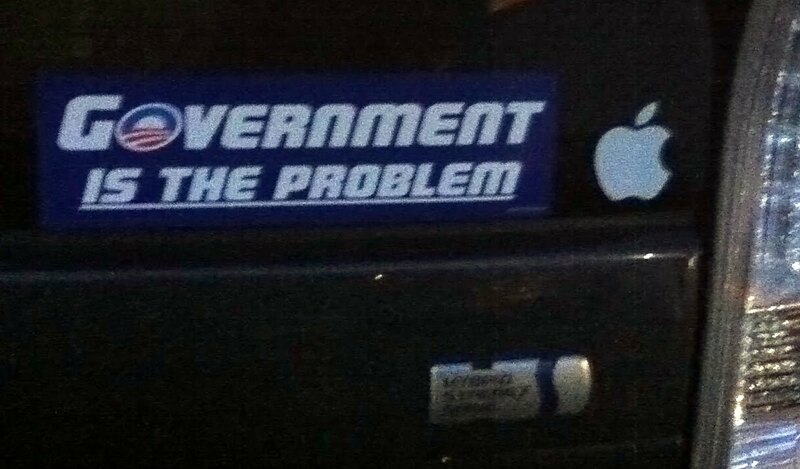 Still, government is the problem. I'm not at all confused.